Frantz Group has been helping clients with account based marketing strategy and campaigns since we were founded in 1993. Account based marketing, or ABM for short is a clear recognition of the complex buying process associated with B2B technology solutions. Knowing that your sales team will frequently face a decision making team comprised of 5 people or more in your target accounts, each with their own influences and biases, taking a strategic approach to these accounts is essential for sales and marketing success in converting technology leads to real dollar closes. A key challenge for many sales organizations is the amount of time and effort required for a sales team to provide proper coverage to accounts at scale. Frantz Group works with your team to help design ways to work together to provide full coverage for a wider set of accounts, promoting not just your solutions & brand, but also helping promote the sales executives assigned to each account, building awareness and rapport to help drive the ongoing relationship forward and enable future sales cycles. Why use Account Based Marketing? If the average purchase decision for B2B solutions involves 3-5 people, a really strong relationship with one of those contacts only gets you 20%-33% of the way to a positive outcome. If that’s as far as you take it, you’re relying on your contact to carry your solution forward and win over the remaining influencers and decision makers. ABM provides a strategic approach for aligning your messaging and content to help inform and influence other members of these buying teams, improving your reach and taking the burden off of your primary contact to help push your deal forward. Done right, the messaging and content will be well aligned with the job roles & areas of influence that these additional contacts may take on, while keeping an eye on the primary purpose of the project. This can position your solution and ongoing services for better adoption and future phases past the initial implementation. How can I improve my approach to ABM? 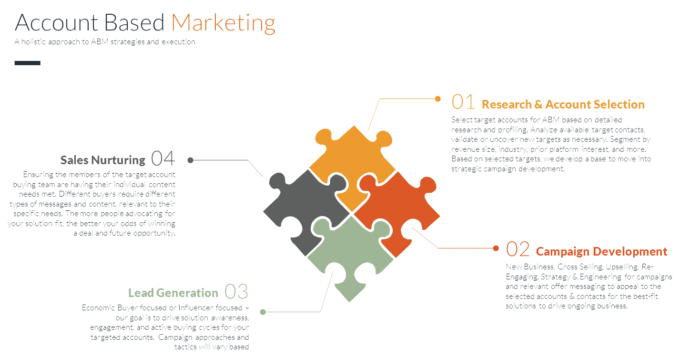 Leveraging our experiences drawn from over 25 years of technology lead generation success, we employ several strategic approaches to ABM programs, starting with an essential partnership with both your marketing and sales teams. Offer development & Campaign Strategy – When developing your campaign, we work to ensure we market the right offer to each organization, providing the appropriate benefits and supporting materials for the right content. Ensuring we have proper messaging coverage for economic buyers, technical buyers, coaches, and influencers is essential for lead generation success, along with driving sales cycles that have a higher propensity to close. Account Profiling – ensuring your core information about these target accounts is accurate before you invest the time and dollars to promote solutions to the target accounts. Done well, this enables you to take a very accurate and targeted approach, aligning your messaging to promote product upgrades to clients who may need them, before you start emphasizing an add on solution that they may not be ready to implement yet. Contact discovery and validation are essential parts of this program, simply relying on purchased data doesn’t provide the initial accuracy your programs will require for optimal performance. Research – Market research & customer satisfaction surveys are just the beginning, as we look to explore important initiatives and pain points for particular organizations, to better align the content and marketing. Lead Generation & Appointment Setting – Where the strategy, preparation, and messsaging meet the market. Our solution experts are well trained in strategic selling and account based marketing approaches. Our lead generation efforts include initial appointment generation for your sales team, as well as ongoing nurturing and networking to help drive interest from additional buying influences, as appropriate for your sales process. Lead Nurture Programs – Establishing automated drip nurture programs and integrating phone based touch points is essential for staying top of mind with prospects, suspects, and leads who may be 6-18 months away from initiating a buying cycle. Sales Nurturing & Engagement – While an initial sales lead or appointment starts with a single target title, the entirety of the sales process will extend across a team of resources at the prospect site. Our approach continues the nurture process through the buying process to ensure that technical buyers, influencers and coaches are receiving the types of content and messaging that encourages them to embrace and evangelize your solution during the buying process. The lead qualification and documentation that Frantz Group provides is very beneficial to me a sales person – because I get a complete background of what the initial discussion entailed, thorough information about what the customer is hoping to accomplish and why, so that I can tailor my follow-up discussion more effectively and help the prospect zero in on a solution that much faster. John Giacomazza, Sr. Manager, Market Development – DELMIA Corp.
Want to learn more about how Account Based Marketing can benefit your organization? Call us at 800-707-0064 or contact us today to discuss your situation, markets, and growth needs today.